This entry was posted in #geoblog, GeoPic of the Week, More Views, Sedimentary Features and tagged Arkansas, Bloyd Formation, Geology, Greers Ferry, Rosselia socialis, trace fossil on January 26, 2016 by argeology. 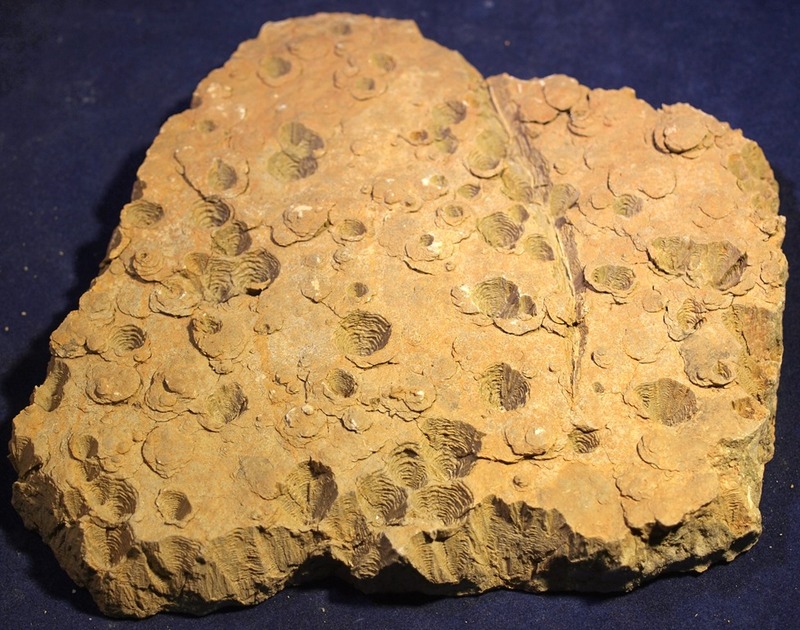 Rosselia – or Rosselia socialis – is a trace fossil that’s common to rocks deposited in a variety of shallow marine environments such as estuaries, tidal flats, lagoons, etc.. This picture was taken in a quarry in the Pennsylvanian Bloyd Formation, near Greers Ferry, Arkansas. Rosselia is a funnel-shaped burrow with concentric cone-like layers, and a sandy plug near the center. The picture shows a side view, or cross-section, of several burrows. 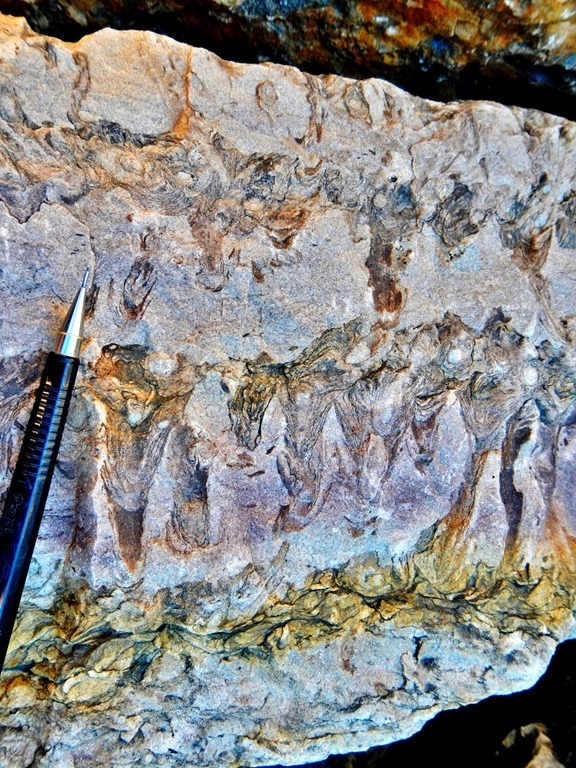 Like many trace fossils, Rosselia was made by a soft-bodied animal that was rarely if ever fossilized. We only know it existed because of the burrows it left behind. They may represent places an animal lived, fed, or perhaps both. One theory suggests the burrows were occupied by worm-like animals that fed by filtering nutrients from sediment, then excreting the sediment outward around their bodies in concentric muddy layers. When new beds of sand were deposited, the animal would crawl to the top of the sand bed and make a new burrow; this behavior is clearly evident in burrows at the center of the photo. Be sure to check out more pictures of Rosselia here! This entry was posted in #geoblog, GeoPic of the Week, Sedimentary Features and tagged Arkansas, burrow, Greers Ferry, Pennsylvanian, Rosselia socialis, trace fossil on January 26, 2016 by argeology. Pictured above is a good example of cone in cone structure. It’s a common feature in limestone, although it can form in other rock types as well. This sample was collected from the DeQueen Limestone of the Gulf Coastal Plain of southern Arkansas. From the picture, you can see that cone in cone structure results in numerous nested cones, which resemble Bugles Corn Snacks (product placement). The craters, visible above, are places where cones have worked themselves out of the rock. In other places you can see the round bottom of a cone: those cones have yet to work free from the rock. Thus far, no one is certain how cone in cone structure forms. Several theories have been offered, but scientists have yet to arrive at a consensus. However it forms, it’s fascinating to look at and wonder about! This entry was posted in #geoblog, GeoPic of the Week, Sedimentary Features and tagged Arkansas, Cone in cone, DeQueen Limestone, diagenesis, gulf coastal plain on January 7, 2016 by argeology.